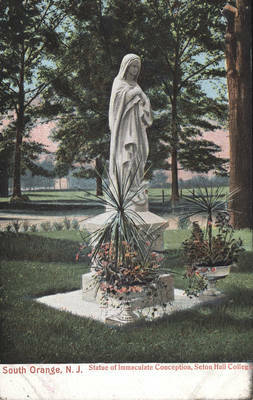 "Statue of Immaculate Conception, Seton Hall College, South Orange, NJ"
Historic Postcards of South Orange, N.J.
[Title]. [Date of Item]. Historic postcards of Seton Hall and South Orange, ca. 1890-2006, Mss 0027. The Monsignor William Noé Field Archives & Special Collections Center, Seton Hall University Libraries, South Orange.